It’s a little like leafing through the pages of a family album. The names themselves don’t reveal much, if anything. But ask the right questions, dig a little deeper and you’ll be richly rewarded. This 22th edition of Cortili Aperti (open courtyards) allows visitors to get a sense of southern Italy’s past. Hidden secrets are concealed behind the heavy doors of palazzi open for just one weekend a year to satisfy the curiosity of visitors and locals alike. The search for “hidden Lecce” begins by leaving Porta Napoli behind and venturing forth along via Palmieri where historic buildings are lined up one after the other like a string of pearls. 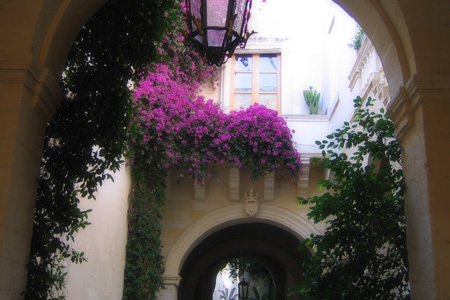 Experience Italian-style gardens and the perfume of citrus, walk under pergolas that still keep vigil over the quiet idleness of the lucky few and start to dream a little. This visit to the courtyards of the Florence of the south opens a window onto the Baroque city’s exotic soul.